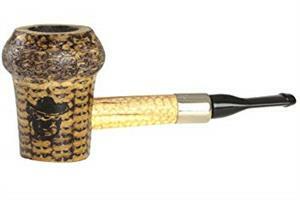 Missouri Meerschaum Outlaw Series Jesse James Corn Cob pipes are a collaboration with the Crow Valley Pipe Company. The Jesse James pipe was inspired by a steam engine's smoke stack and features a wide nickel band. Comfortable in the hand, it has it's own unique label and is branded on the side of the bowl with the Outlaw Series Bandit. This pipe has a genuine hardwood insert in the bottom of the bowl. The Jesse James is a great smoking mid-sized pipe with a unique appearance! The Jesse James has a Smoke Stack-shaped bowl with a hardwood bottom and is stained dark for a burnished appearance. Has a wide, nickel-plated band on the shank. 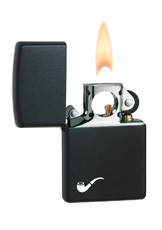 A great smoking mid-sized pipe with a unique appearance! 4-1/2" Long & Bowl is 2-1/4" Tall.